When are you going to fulfill your obligations to your Two Towers subscribers and finish the series? The answer is: as quickly as possible. And I will not release any other patterns until I finish these. Several things changed about a year ago, which threw my usual release schedule severely out of whack. My husband got a higher paying job and without paying college tuition, our financial picture eased up, so I was no longer so dependent upon a new pattern every month to pay the bills. I eased up on myself & found it hard to go back to work once I had grown unaccustomed to my previous frenetic pace. Our youngest son, who had been living with us for the past year, got a nighttime job and moved out on his own, but was unable to afford night time care for his 3yo son. So we stepped in and began caring for him in the afternoons & evenings. This increased my grandma time and reduced my designer time. I could knit while he was here, but not on anything terribly complicated. And I can spin (more on this later) But 5 nights a week with a toddler who insists on sitting in your lap really cuts into the time. Once he moved out, we began working on our current house, in which we have lived for the past 30 years; cleaning out closets, tearing down wallpaper, painting, replacing appliances, updating the kitchen, packing up the studio, etc. It has been a real whopper of a task and one which my husband feels I don't give enough time to. We are close to being ready and hope to get the house on the market in February. At the same time, we are traveling north for a series of meetings with the architect in Michigan on the design of the new house and studio. It is so exciting to be moving forward finally on our 9 acres of God's country. I broke my hand in January and was unable to knit for 3 months, while it healed, which put me even farther behind. And I have been working on projects that require the completion of the entire garment, rather than a repeatable motif that can be vetted in a brief amount of time and photographed in a half-completed state. I took time for professional enrichment and networking, traveling extensively this spring & summer, attending retreats & taking classes. 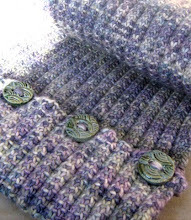 I knit some other people's patterns, which I had not done in 5 years, and carefully studied some alternative techniques and methods of construction. 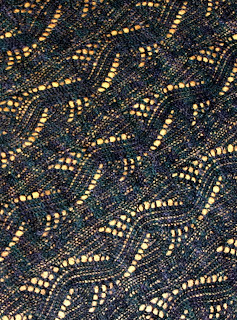 I learned to spin while my hand was in a cast and will be launching Spinspiration, a new series of patterns that will include directions for both spinning & knitting the finished objects, in 2013, after I finish the Two Towers series. I have been working on these projects concurrently with the LotR patterns, so I can get them into testing. There will be more information about this forthcoming. Rohan was ready to go in May, but I figured no one was going to want to knit on a big pile of Fair Isle in the heat of the summer, so I put her on the back burner till Fall. 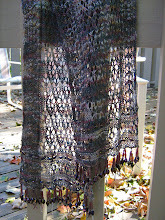 Pattern has been fully tested and will go to proofreader this week. Here are some pictures to whet your appetite. Ringwraith is also completely through the testing process and will be out later this month. Emyn Muil is about halfway finished. 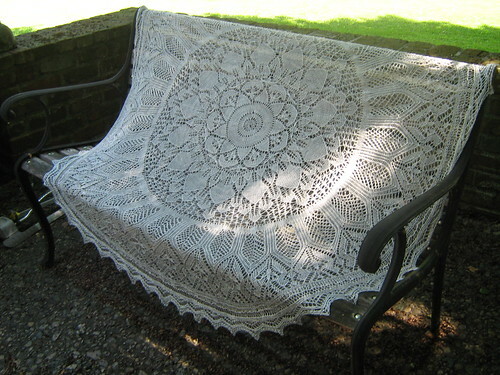 I redesigned the piece when I picked it up again this summer, swapping the Madelinetosh lace for Brooklyn Tweed's Loft for a more rustic appearance. 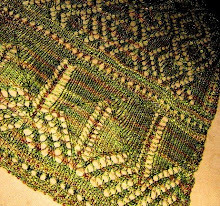 I love the many subtle colors in the yarn (I used Meteorite) I also changed the shape of the shawl from a triangle to a crescent and added a bottom border. 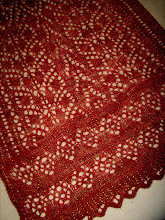 Now the shawlette is much closer to what I had envisioned. 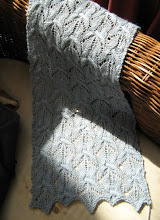 It has a Shetland feel to it and I can't wait to share it with you. It heads into testing next week. 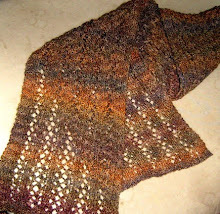 I wanted to be sure I had a full half shawl lead on my test knitters, so I can stay ahead of them as they work on the first half and I complete the second. 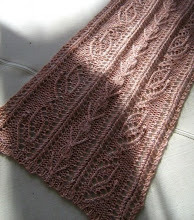 Once that is done, I will move on to Eowyn (twisted stitch. 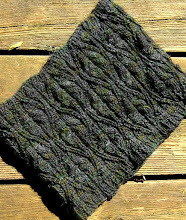 lace up gauntlets) Eleventy Seven (lace scarf in black metallic handspun) and wrap up the series with Elven Woods (a lace ruana/tunic in Unique Sheep Gradiance). I have been a terrible procrastinator and hermit. I stopped blogging to let you all know what was going on. 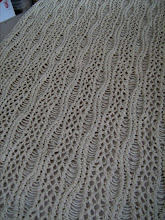 I stopped posting updates on the boards of Ravelry. I haven't sent out a newsletter in months. I have been, at times, dreadfully non-responsive to email. I have continued to design & produce, but not to publish and notify. I have been struggling with a recurrence of the depression that dogged me several years back. Life has been very busy this year and I am not a good multi-tasker. All too often, when faced with the question of "do I work on the house today, or work on Sunflower Designs? ", I have chosen to put my head down and knit (or spin). When I feel overwhelmed I do what my family refers to as "ostriching". 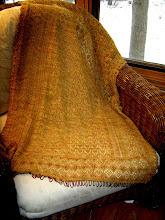 I bury my head in the sand (or in this case the fiber & yarn) and ignore the rest of the world. It is a long established coping mechanism of mine. I don't know if it is healthy, but I do know it is annoying to those with whom I interact: my family, my friends, and most of all, my customers. And for that I most humbly beg your pardon. I have let you down and I will try my darndest to do better moving forward. Feel free to poke me regularly, as Kristin did this morning. While you wait for Rohan & Ringwraith, here is a little something I whipped up last winter and never brought to publication. 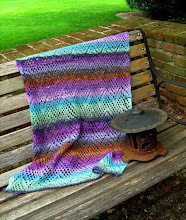 All subscribers will get this pattern free of charge as part of my apology. To others, it will retail for $4. This pattern is easily modified by adding or subtracting repeats. 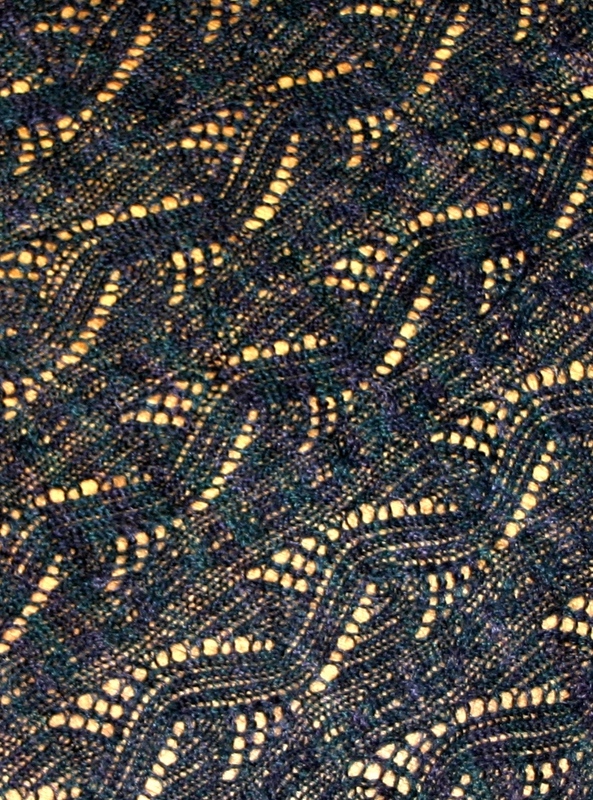 If you wish to add extra repeats, you will need 3 skeins of yarn. Thank you for all the kind notes of sympathy upon the passing of our much beloved Pippin. They meant more than I can say. We miss him every day but have a new little boy in our life. This is Gandalf (the grey AND white). Contrary to appearances, he has been a handful already. Talky, playful, with a magnificent purr. He is helping us heal. Thanks for sticking with this long post, but mostly for your extreme patience with me. 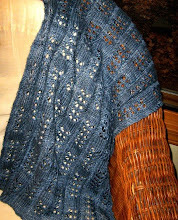 Now I'm off to email the subscribers and post the pattern on Ravelry. Just so happy to have you back!!!! 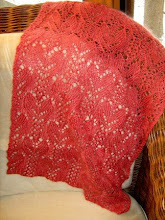 Looking forward to a shawl lace KAL sometime in the dead of winter. I had to put In Dreams in the corner. I will grab her and get'r'dun. Congrats on the new house, the new kitty and finding your way back <3. There are times and seasons in our lives. I hope you season of quiet has been healing for you. Welcome back! Susan, there are times when life throws you continual fireballs that you seem to be unable to dodge. You'll just about get up from the first one, and the next one slams you in the head. I've been in that position. Granted, not your exact situation, but we all have our own issues. I'm glad that you are coming out from under the avalanche, and wish you strength and love. I will wait, however long I need to, for your designs to be published. While I do know the feeling of getting kicked while you are down, I also know that the love of friends is what kept my head above water and helped me through. I wish you love, healing and happiness. When we get hit with a series of setbacks and are having "interesting times", my husband insists he is God's cat toy. You know how cat toys get lost under the couch and forgotten for a while and then the cat finds them and bats them around again? Well, when interesting times hits, that's when God has remembered that we are under the couch and bats us around. We are (hopefully) coming out of some interesting times and are hoping to hide under the couch for a while! I hope to see you there. The road of life is strewn with rocks and potholes. Glad you are on the healing path. I know how depression can sometimes make you procrastinate. So, I am happy to hear that you feel better, have a new cat in your life (Gandalf is soooo cute), and that life is moving in the right direction again for you. You were missed, worried about, and loved. So glad you are on your way back...and the kitty certainly helps along the way ! So many of us can sympathize and empathize, and we all send you love and strength. Spinning is great therapy !